You are driving home, anxious to put the day behind you and relax with your family. Out of nowhere, another vehicle appears, smashing into the side of your car. You exchange bewildered stares with the driver of the other car, trying to get your wits about you, when, with a sudden pitch, the other driver lurches into reverse, and speeds away. You realize a number of things all at once: a dull ache is creeping across your entire body, your car is still in the middle of an intersection blocking traffic, and you don’t really remember much about the other vehicle, let alone the license plate number. Unfortunately, hit-and-run accidents are all too common in Florida, topping 90,000 in 2015 alone. Where does that leave you? You definitely want to place yourself in the hands of a competent personal injury attorney immediately. In Florida, drivers are required to remain at the scene of an accident. In addition to exchanging critical information, they are expected to secure medical help if necessary, and must contact law enforcement if there appears to be damage exceeding $500, intoxicated driving, or serious injuries. Failure to comply with these expectations could result in the revocation of drivers’ licenses, civil charges, or even criminal charges. Florida statute does not look kindly upon drivers who leave the scene.A driver who flees the accident when there is property damage can be charged with a second-degree misdemeanor, which carries up to a $500 fine, 60 days in jail, and 6 months of probation. If the accident involves injuries, the driver can be cited with a third-degree felony, and penalties can go as high as $5,000, 5 years in prison, and 5 years of probation. 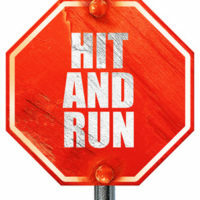 Finally, when a hit-and-run driver leaves the scene where a fatality has occurred, that driver can be sentenced to a minimum of 21 months, and as much as 30 years in prison, 30 years of probation, and a $10,000 fine. Any auto accident is unpleasant; but a hit-and-run accident has the additional stress of having to chase down an errant driver who wanted to avoid responsibility for the incident. Dealing with the damage to your vehicle in these circumstance is stressful enough; medical bills and a recovery effort can put additional strain on anyone. If you are involved in a hit-and-run accident, competent, assured legal assistance could make a huge difference in the outcome of your case. Our experienced team at The Law Offices of Robert W. Elton knows just how to proceed to aggressively pursue justice on your behalf. Contact our Daytona Beach/Ormond Beach office today for your no-cost, confidential consultation.